Criss Angle directed Dee Snider in this stripped down version of Twisted Sister's hit "We're Not Gonna Take It". Angel's direction of the video is clearly in support of his children's cancer foundation, CrissAngelHELP.com and for the upcoming Children's Cancer awareness month of September. Unfortunately the video ended up a big ball of cringe for Snider and Angel. Three cheers to them for raising awareness for Children's Cancer! Unfortunately, it didn't detract from Snider looking like a worn-out and leathered Legolas, or from the idea that Criss Angel just isn't a good enough Magician to make Cancer disappear. There are some people who just shouldn't do the 'Nae Nae.' For example: Your mom, Bugs Bunny and these two. Never mind that Gary Busey looks like a literal insane person (that's kinda his thing), but look at Paula. Paula Deen dancing to a popular hip-hop song—this could not end well. Watch her whip, whip. Get it...like a chef. The Minnesota State Fair just doesn't get fine art. 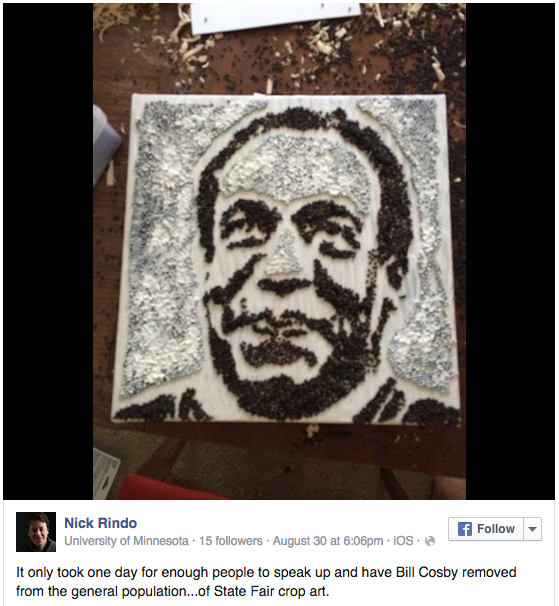 This portrait of Bill Cosby caused quite a stir at the fair before it was taken down after being up for only a day. The portrait, made form "rapeseed" or canola seed, was created by Nick Rondo, a 37-year-old software engineer. He wasn't surprised people complained. 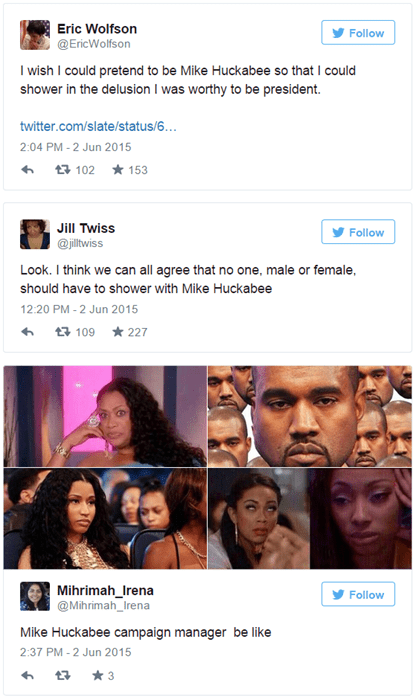 "The point was just to see, would there be outrage? Would there be people talking about it? Would it even get through?" he told Pioneer Press. Although the portrait was originally allowed into the fair, an official made Rondo cover up the word "rapeseed" on his work, which basically defeats any type of message the artist was trying to make. Despite the removal of the portrait, Rondo said this was for the best. "I think it's actually maybe the best possible scenario," he said. "Up for a day and then taken down." Caitlyn Jenner introduced herself to the world on Monday by appearing on the cover of “Vanity Fair,” breaking the internet and winning practically everyone over with her new look. 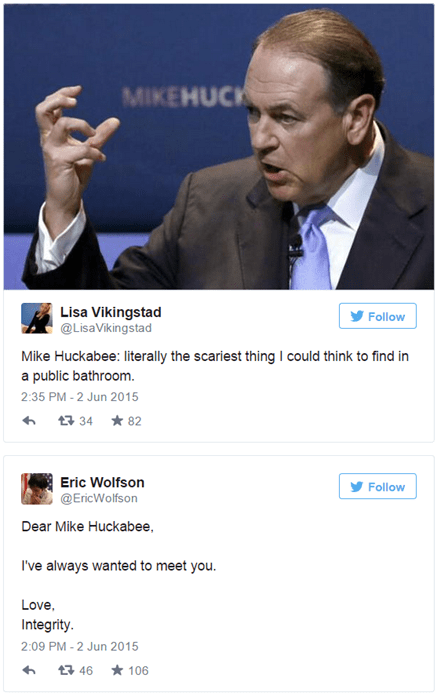 And on Tuesday Mike Huckabee also started making waves online… for being a total creep. At the National Religious Broadcasters Convention back in February, the former Arkansas governor was discussing the issue of gender identity, when he made an offensive joke that mocked people who are transgender. World Net Daily uploaded the video to YouTube this past weekend, so it just started to get national attention this week. Any sliver of a chance he had a becoming president just went down the drain with that punchline. 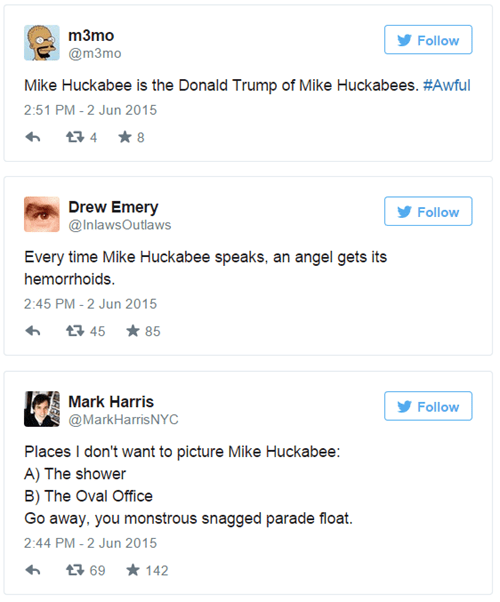 Meanwhile on Twitter, the Huckabee jokes are top notch. Thursday was Texas Muslim Capitol Day in Austin, and a bunch of anti-Muslim protesters and a Texas lawmaker made things really weird. The event is held every 2 years and is organized by the Texas chapter of the Council on American-Islamic Relations as an opportunity for the Muslim community the meet with lawmakers. This is the first year that protesters have showed up, according to the Texas Tribune, and one woman took things to a whole new level of crazy when she pulled a Kanye on one of the speakers. State Rep. Molly White also created a stir with a Facebook post about the event in which she requested that Muslims visiting her office publicly pledge allegiance to the U.S.
Of course, people online aren’t taking this very well. Speaker of the House Joe Straus issued a statement afterwards commenting on White’s mandatory oath. The uploader of this video could sense this woman’s rage as she dealt with the person at a ferry’s ticket counter, so he started recording. Thanks to his quick thinking, we are now blessed with this fantastic moment where she flips the hell out. In case you can’t tell, she is “so mad.” SO MAD. The Price is Right has been especially cringeworthy lately. First we had this little gem a few days ago, where one contestant celebrated his win a bit prematurely, while his competitor made one of the worst bids we have seen. These two clueless contestants seem to think iPhones are made out of solid gold and unicorn tears. "I hope the marketing people at Apple are watching this," said Drew Carey. The reactions from the audience are priceless. Did you watch the final game of the World Series? No? Well, aside from know that the San Francisco Giants beats the Royals 3-2 in game 7, this video is all you need to see. Rikk Wilde is a Chevrolet representative who was tasked with presenting the World Series MVP trophy to Madison Bumgarner. And to talk about… "technology and stuff." On July 1st, 2014, Japanese politician Ryutaro Nonomura held a press conference in which he aimed to apologize for his suspected misuse of 3 million yen. However, during the conference, this 47-year-old provincial politician started to break down in to tears while trying to defend his actions, and began wailing uncontrollably.